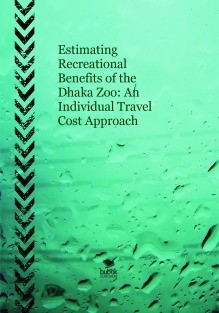 This study estimates recreational benefits of the Dhaka Zoo by Individual Travel Cost Method (ITCM). The study estimates the benefits of operating the Zoo along with revealed visitors willingness to pay to visit and enjoy the Zoo. The total annual consumer surplus from recreation of the Dhaka Zoo is estimated at approximately BDT 856.4 million (US$ 10.98 million). Study has found that Various factors influence the value visitors obtained from the Zoo; these include travel cost, household income and the environmental quality of the Dhaka Zoo. Improvements in the overall quality of the Zoo is likely to increase recreational benefits of the visitors and also visitation rates. The study recommends that current Dhaka Zoo entrance fee of BDT 20 per person could be adjusted every year. This would generate enough revenue to cover the operating and maintenance expenses of the Zoo. 2. Associate Professor, Departments of Economics, University of Dhaka.